Ypres, or “Wipers,” as the British Tommies called the ancient Belgian city, is synonymous with World War I. An extraordinary number of lives were lost there and in the nearby salient during seemingly endless fighting over the course of four years. Numerous monuments and cemeteries dot the landscape and remind one of the horrors of war. One such monument pays tribute to the American 27th and 30th Divisions. These two divisions, comprised largely of National Guard troops, received their baptism of fire on 30 August-1 September 1918, when they engaged veteran German forces on one of the area’s highest points, Kemmel Hill, and the surrounding villages of Vierstraat, Vormezeele, and Wytschaete. The Germans had gained the positions in April of that year but were in retreat when the Americans arrived. Nonetheless, they refused to retire quietly and, in the process, taught the eager doughboys a lesson in combat along the Western Front. When this operation commenced, the Americans were into the second phase of instruction by the best soldiers the Allies had to offer. Soon after arriving on the Western Front in the spring of 1918, the American Expeditionary Forces (AEF) commander General John J. Pershing reluctantly sent the 27th and 30th Divisions to train with the British Army. It was his way of appeasing Field Marshal Sir Douglas Haig, who insisted that American doughboys amalgamate into the British Expeditionary Force (BEF) to fill the ranks of his depleted army. Pershing, however, had other plans. He sought to form an independent army and resisted the constant pressure from Haig. It was only when the U.S. War Department accepted an offer from the British to transport American troops to Europe that Pershing allowed Americans to train with Haig’s Tommies. Additionally, Pershing agreed that the British would equip, feed, and arm his men, and that they could also be utilized at the front should an emergency arise. Under this program of training, ten American divisions spent time in the British sector as the American II Corps. The agreement also benefited the Americans since the War Department lacked the shipping to send troops overseas, nor did it have enough arms on hand to issue them to every soldier. Peace between the two commanders, however, was diminished when Pershing reassigned eight of the divisions to his newly organized American First Army. Pershing wanted all ten divisions back, but Haig vehemently protested and was allowed to keep two—the 27th and 30th. They remained behind as the AEF’s smallest corps. Haig now had about 50,000 fresh American soldiers to utilize as he saw fit. An AEF division comprised roughly 27,000 officers and men, but the 27th and 30th never reached this strength. Their artillery brigades arrived in France separately and were immediately assigned to First Army. 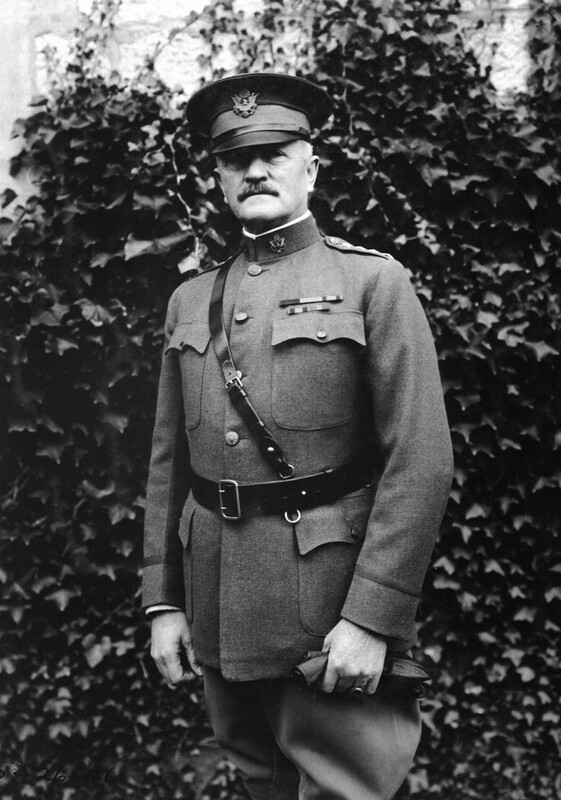 Pershing also did not allot replacements to the 27th and 30th until after the Armistice, a sign that he considered them of lesser importance than his other divisions. Major General John F. O’Ryan was the 27th Division’s commander and the highest-ranking National Guard officer to command such a large contingent of troops during the war. He was a disciplinarian and his troops were recognized for their professional demeanor that ranked alongside units of the Regular Army. The division was comprised of troops from all over New York, including men from some of New York City’s most prominent families, as well as farmers and laborers from all over the Empire State. 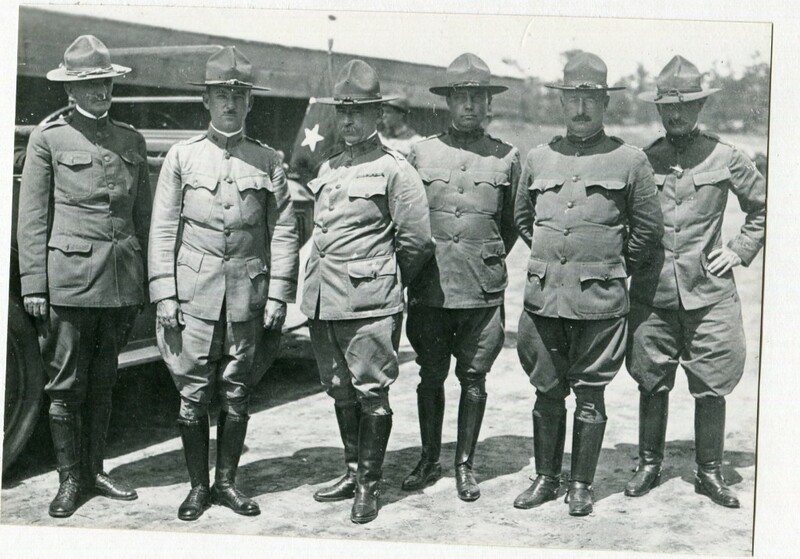 Prior to service overseas, the New Yorkers were sent to the Mexican border in 1916 during the Punitive Expedition as the 6th Division, the only Guard unit organized in this fashion. The 27th Division adopted an insignia that consisted of a red-bordered black circle with the letters “NYD” in monogram with the stars of the constellation Orion, in honor of their commanding officer. The 30th Division was more typical of the National Guard. A composite of regiments from North and South Carolina, and Tennessee, the division came together at Camp Sevier, near Greenville, South Carolina. 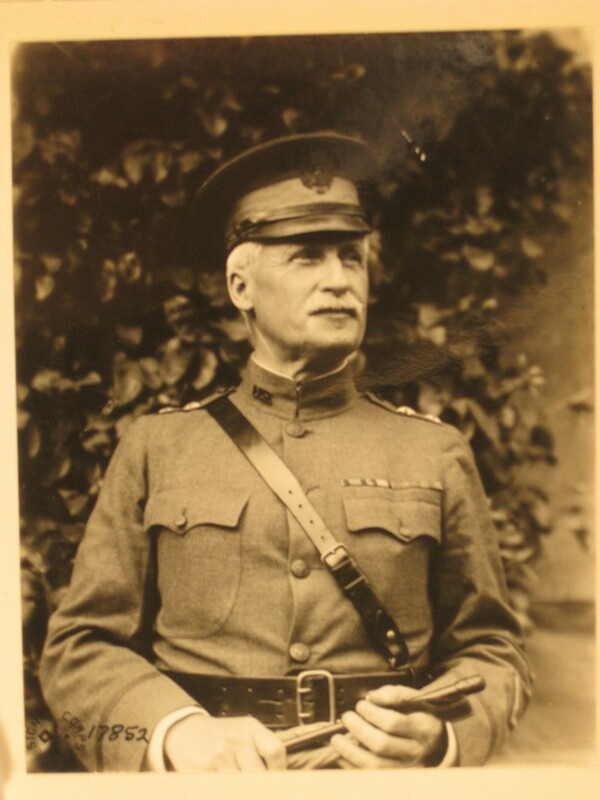 During the course of the war, nine different general officers commanded the division until the Army settled on a West Point classmate of Pershing, Major General Edward M. Lewis, who had previously led 3d Infantry Brigade, 2d Division. The 30th Division, nicknamed “Old Hickory” after President Andrew Jackson, included units whose lineage dated back to the War of 1812. Like those of the 27th, the regiments of the 30th Division regiments had served on the Mexican border during the Punitive Expedition. 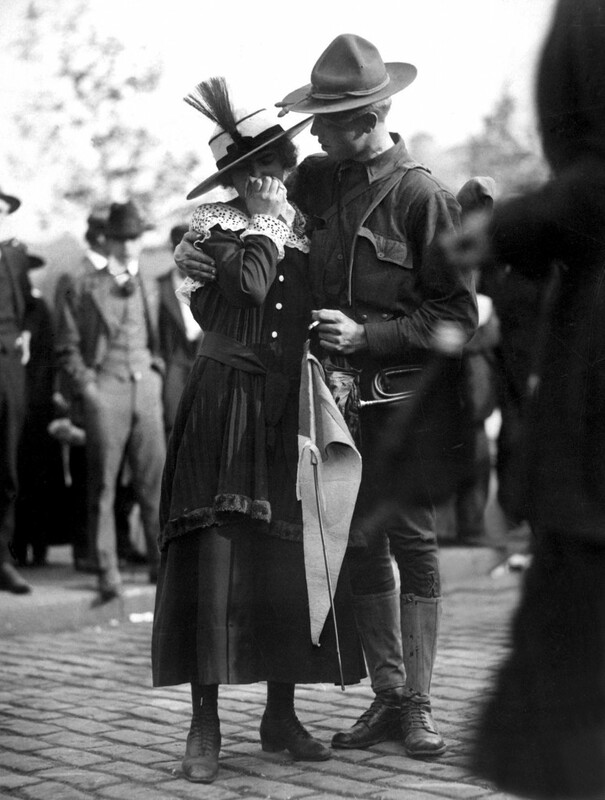 A soldier boy of the 71st Regiment Infantry, New York National Guard, saying good bye to his sweetheart as his regiment leaves for Camp Wadsworth, Spartanburg, S.C., where the New York Division trained for service. 1917. IFS. For more than eight months, both divisions underwent intense physical fitness training, conducted maneuvers in open warfare, and attended lectures from British and French officers sent to the United States as advisors. Units of the 27th and 30th Divisions began arriving in France during the last week of May 1918. Entering the ports of Calais and Brest, the Americans were welcomed to the war zone with the distant thunder of artillery pieces and nightly German air raids. After days of hard marching, both divisions were assigned to a sector behind the British front lines to begin training. To ensure compatibility with the British soldiers, the Americans were required to trade their beloved .30 caliber Model 1917 rifles for the Lee-Enfield Mark III. The training program designed specifically for these divisions consisted of ten weeks of instruction for infantry and machine gun troops to be carried out in three periods. 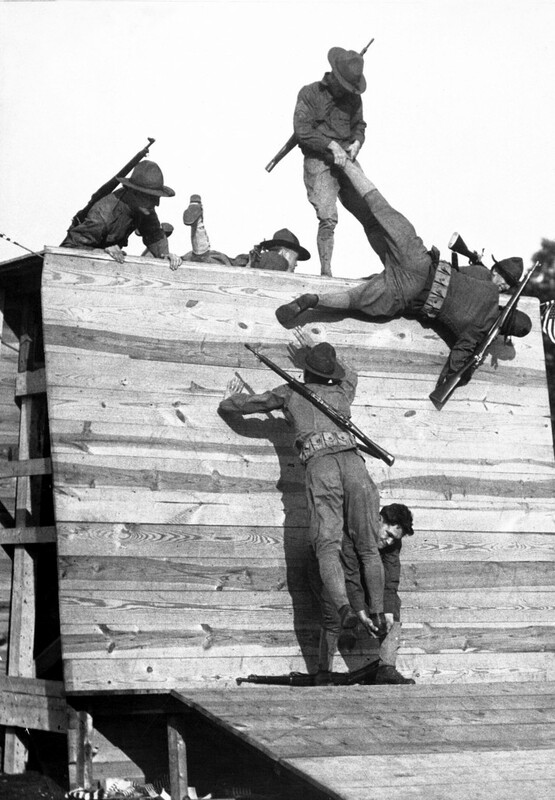 First, they trained out of line for a minimum of four weeks, encompassing drill, musketry, and physical exercise. 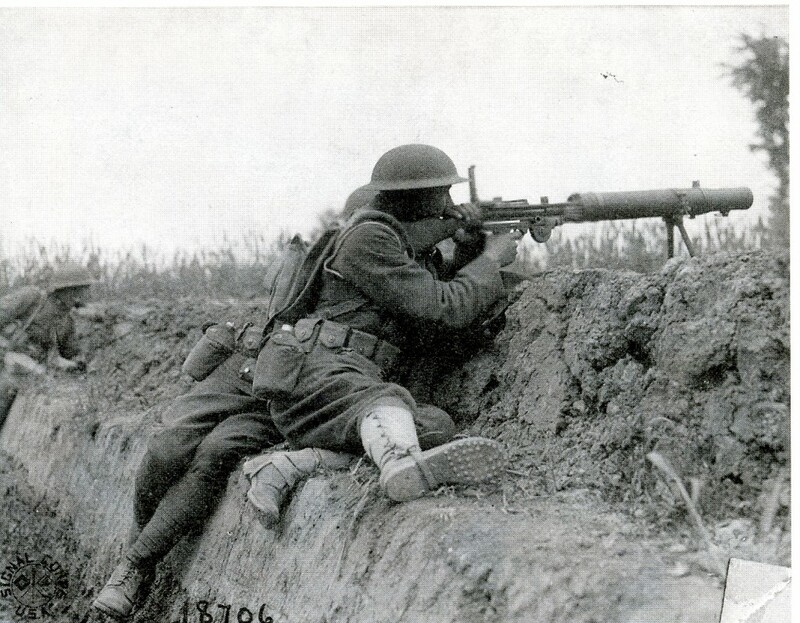 This included tutoring in the Lewis machine gun and other infantry weapons. Next, the Americans were to attach with British troops in the line for three weeks. Officers and noncommissioned officers would enter for a forty-eight-hour period, while the men joined up with British companies and platoons for shorter periods. Finally, each regiment was to train in a rear area for three to four weeks to provide more advanced instruction. There, the Americans would practice maneuvering battalions and companies. For the most part the doughboys and Tommies got along well. Not surprisingly though, the Americans complained about the British rations. Accustomed to American food served in large portions, they were instead issued a small meat ration, tea (instead of coffee), and cheese. During the second period of training, the 27th and 30th Divisions were assigned to the British Second Army for training and moved to their sector, southwest of Ypres, to organize and defend a portion of the East Poperinghe Line. The position took its name from the town of Poperhinghe, situated several kilometers north and consisting of an irregular system of unconnected trenches, strongholds, and pillboxes. During the first part of August, the 30th Division moved near Poperhinghe and Watou, where it came under the tactical control of the British II Corps, while the 27th assumed the second, or reserve, position in the British defenses near Kemmel Hill, under the command of British XIX Corps. This included Dickebusch Lake and the Scherpenberg areas. Both divisions were now only four miles from the front and well within range of enemy artillery. On 13 July, Private Robert P. Friedman, a member of the 102d Engineers, died as a result of wounds from German shellfire and became the first combat casualty suffered by the 27th Division. Friedman was one of many Jewish soldiers, both officers and enlisted men, in the 27th, and his loss was mourned by all in the division. The 30th Division had its first combat-related death a month earlier, when First Lieutenant Wily O. Bissett of the 119th Infantry, was killed in a similar manner on 17 June. In Belgium, the Americans witnessed the hardships suffered by the civilian population. 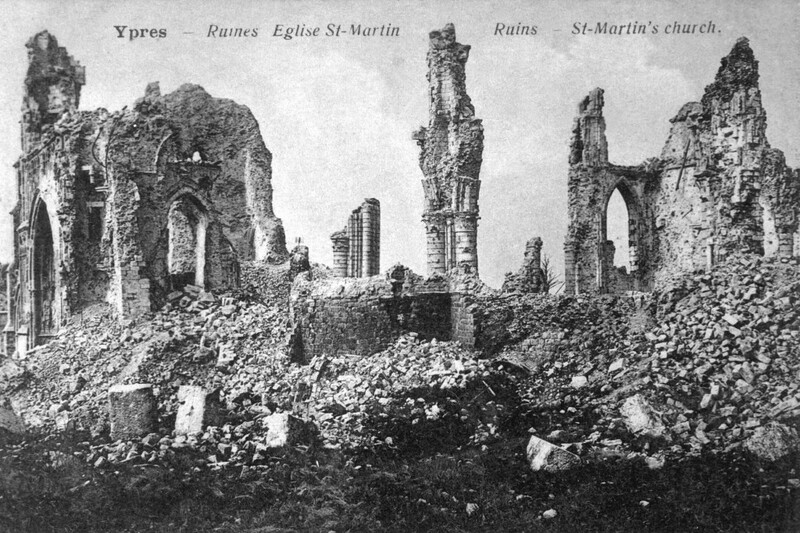 Although shelling had all but destroyed the villages around Ypres, it failed to break the spirit of the Flemish people. As farmers continued to cultivate their fields, engineers from the American divisions on the East Poperinghe Defense Line were specifically instructed not to damage the crops. This was a difficult order to follow since the laying of wire entanglements near the front meant clearing some of the crops despite protests from the farmers. Over the course of several nights, 16-24 August, the 27th and 30th Divisions prepared for combat. The 30th Division ordered its 60th Infantry Brigade to take over the Canal sector from the British 33d Division, located on the north face of the Lys salient southwest of Ypres. The 119th Infantry was on the right side of the line, the 120th Infantry on its left. In reserve was the 59th Infantry Brigade (117th and 118th Infantry Regiments). A week later, the 53d Infantry Brigade (105th and 106th Infantry Regiments), 27th Division, relieved the British 6th Division in the Dickebusch sector. It took over the front and support positions with regiments side by side and the 54th Infantry Brigade (107th and 108th Infantry Regiments) in reserve. The British divisions left their artillery units to support the Americans. Troop movements, as well as the transport of supplies, were carried out by light railway and conducted during the night to avoid attracting fire from German artillery on Kemmel Hill. In advance of infantry and machine gun units were the 102d (27th Division) and 105th (30th Division) Engineers. They had the difficult and dangerous task of repairing pockmarked roads, made nearly impassable after three years of shellfire. Once the troops reached the front, they were quartered in wooden huts built by British engineers. Two squads of eight men, with a corporal in charge, slept in a hut, which one occupant described as spacious. To coordinate liaison between the infantry and the artillery, work details had to lay cable. This meant digging a six foot trench through the hard Flanders clay that was not unlike the soil of South Carolina. Each day involved surveillance from observation posts and airplanes. The first few days were reported as calm. A “quiet, inoffensive attitude,” is how a 30th Division officer summarized this period. Such calm, however, did not last. Suddenly, as the division’s historians noted, “the scene had now shifted to the battleground of the World War—a stern and terrible reality to the men of all ranks.” They were referring to night patrols sent out as far as 1,000 yards to probe enemy defenses. Troops patrolling too close to the German outpost lines were greeted with machine gun fire. At first, the Germans were unaware that Americans had entered the sector opposite them, but according to a prisoner interrogated at 27th Division headquarters, this changed when the rifle fire became “more brisk and haphazard.” When asked to elaborate, the soldier from the German 93d Infantry Regiment explained that soldiers “who have been in the war for some time only fire individually when they are sure they have a target, whereas new troops are apt to fire more or less constantly at night, whether or not they have a target.” The considerable shooting and muzzle flashes allowed the Germans to better pinpoint the American line of advance. Once they recognized that untested American troops were opposing them, it became a daily ritual to try their mettle by harassing them with artillery fire, lobbing shells into back areas to hit crossroads and villages. On 30 August, the enemy conducted a surprise move that further tested the doughboys. In the early morning, heavy clouds of smoke crept toward the American lines. An initial report said it was a gas attack, but further observation revealed the Germans were burning dumps of some kind to mask a withdrawal. A prisoner captured near Kemmel Hill confirmed the updated report when he told interrogators that troops were retiring to the Wytschaete-Messines Ridge. He claimed a new line was established in front of Armentieres, and that eight men per company in machine gun posts remained behind on Kemmel, where they were to give the impression of strength. That night British XIX Corps headquarters ordered O’Ryan to send patrols from his brigades to reconnoiter the left of the line, opposite the 30th Division. This order was not unexpected. Earlier in the day O’Ryan and Plumer met and the latter remarked casually after tea, “Oh, by the way, O’Ryan, how would you like to have a go at our friends on the ridge?” O’Ryan responded that “his men were there for that purpose,” and was then told by Plumer to have a word with his chief of staff. O’Ryan then discovered that the details of the plan and tentative corps order were already in place. O’Ryan went into action and instructed the 53d Brigade to move elements of the 105th and 106th Infantry Regiments toward the German trenches to determine the depth of the withdrawal. As they approached the German lines, there was minor resistance from scattered machine gun posts. The patrols were accompanied by members of the British 184th Tunneling Company, which checked the vacant enemy dugouts for mines and booby traps. After reaching the enemy positions, the patrols reported back to brigade headquarters that the prisoner’s statement was correct—the Germans had given up most of Kemmel Hill. Additional patrols were organized and told to be ready to advance in support of those sent out. Soon, the Americans were gearing up for their first battle as entire regiments. On 31 August, the British II Corps ordered the 30th Division to send out patrols in its sector to determine enemy strength and location. The division commander, Major General Lewis, chose the 60th Infantry Brigade and made it clear that if strong resistance was met, the brigade was to return to its entrenchments. Small parties from the 119th and 120th Infantry Regiments moved out, and like those of the 53d Brigade, found the German defenses at Kemmel Hill mostly abandoned. Additional parties from the 30th Division held nearby positions at the Voormezeele Switch and Lock 8 of the canal. The Germans were still close by in strength, so Lewis ordered his troops to hold tight and await further orders. Relaying messages was difficult because the Germans kept a close eye on the runners and frequently fired on them, so the Americans mostly communicated by wire. To ensure there was little delay in this method, the 105th Signal Battalion laid 15,000 feet of cable along this position to establish a forward communications post. At 0730 the next morning, Lewis gave the order to advance. After a brief barrage, a platoon of forty men from Company I, 120th Infantry, moved forward towards Lankhof Farm. There, the Germans had constructed a cluster of pillboxes in the ruins of an old farm building and positioned machine gunners and snipers. As the Americans advanced, the Germans withdrew to the canal and abandoned their defenses at the farm, suffering only two casualties. The platoon then pushed beyond the farm and established contact with the 119th Infantry advancing on the right of Lock 8. Artillery from the British 33d Division fired in support, but several rounds fell short, wounding a number of Americans. Friendly fire incidents were an unfortunate consequence of war, and the 30th Division had recently lost two men this way. In the first instance, First Lieutenant Robert H. Turner of the 115th Machine Gun Battalion was struck on 24 July by a shell from the 186 Battery, Royal Field Artillery, while he and another officer were on patrol near a Belgian chateau. In the second occurrence, Second Lieutenant Lowell T. Wasson of Company M, 120th Infantry, was shot by a private from his unit on 7 August. Wasson apparently became confused after returning from a patrol near Swan Chateau and had entered a listening post unannounced. The private guarding the post was ordered to fire on Wasson by his superiors, who thought the intruder was a German conducting a trench raid. With the 119th taking fire from both its own artillery support and the Germans, two more platoons from the 120th Infantry were sent forward to help relieve the chaotic situation. After advancing 1,000 yards, they retired, having lost touch with both flanks. The Germans complicated matters with fire from trench mortars and machine guns hidden in Ravine Wood. At 1000, 2d Battalion, 119th Infantry, advanced and held on against heavy resistance. During this action, a patrol that included Corporal Burt T. Forbes of Company I, was acting as a flank guard when a squad of eight Germans approached. As the enemy started setting up their machine guns, Forbes charged the Germans, single-handedly killing three and driving the other five away. For this act of bravery, he was awarded the Distinguished Service Cross and the French Croix de Guerre. Word of the action was sent to the rear by pigeon. It was the first time this means of communication had been used by the 30th. Remarkably, only one hour and five minutes elapsed between the time the message was sent, received and transmitted by the division staff. After intense fighting, the 30th Division’s contribution to the operation was over. It gained one square mile of ground, inflicted one hundred German casualties, and captured sixteen prisoners, two machine guns, one grenade launcher, and a small amount of ammunition and stores. Kemmel Hill was now in Allied hands and, as one doughboy remarked, “it sure is a blessed relief to move around without feeling the German eyes watching you.” In the process of taking this coveted piece of land, the 30th lost two officers and thirty-five men killed. In the 27th Division sector, the British XIX Corps ordered O’Ryan to begin advancing his division at 1000 on 31 August and occupy a line along the Vierstraat Switch, 1,000 yards from their present location. Patrols from the 106th Infantry advanced along the line until held up for three hours by machine guns concealed in numerous nests near Siege Farm. The Americans retaliated with their own machine guns, and artillery fire from the British 66th Division. By 1730, the Germans had been driven back and the objective gained. August ended as another bloody month on the Western Front, and September started off the same way. On the morning of 1 September, the 105th Infantry went forward on its right to pivot on the 30th Division at Vierstraat Village. As the Americans attempted to advance to the east crest of Vierstraat Ridge, the Germans continued to resist and drove the Americans back to the village. During the fighting, the doughboys used some creative methods to send messages to the rear; the 102d Signal Battalion sent messages using pigeons and dogs. Amazingly, the dogs successfully maneuvered over broken ground, under heavy fire to deliver messages. Despite such valiant efforts, communication was still difficult, as reflected in a frantic field message sent from 1st Battalion, 105th Infantry: “Our new position very heavily shelled, making communications almost impossible…request that artillery open fire on hill opposite our new position.” Information on why the regiment was stalled did not reach brigade headquarters until late in the day on 1 September. Messages were delayed because shellfire had cut the forward communication wire. To help remedy the troubling situation, Corporal Kenneth M. McCann of the 102d Field Signal Battalion worked for seventy-two hours, while subjected to repeated gas bombardments and machine gun fire, to replace the forward line near Kemmel Hill. For his extraordinary efforts, he was awarded the Distinguished Service Cross. More discouraging news reached the rear from an officer observing at the front. On the left of the 106th Infantry, two battalions had become badly mixed up and crowded into the line. When word reached the 53d Infantry Brigade commander, Brigadier General Albert H. Blanding, he ordered the commander of the 106th, Colonel William A. Taylor, to the front to investigate. Taylor reported two hours later that the officer in command at the front, Major Harry S. Hildreth, had “apparently entirely lost control and seemed at a loss as to what to do.” Blanding ordered Taylor to immediately relieve Hildreth and take command. Not until daylight the following morning was the situation in hand. Hildreth was only temporarily reprimanded. He was lucky this was his only punishment since it was commonplace in the AEF, as well as the BEF, to permanently relieve commanders from their units for poor performance. Hildreth returned to battalion command in the 106th a few days later. On 1 September, Blanding ordered his brigade not to make a general attack, but to advance the front line as far as possible. With the help of artillery harassment, the two regiments moved forward, and by the afternoon of the next day, had captured the southern slope of Wytschaete Ridge. At noon on 2 September, Taylor phoned Blanding and requested permission to dig in on the line of the first objective and wait for relief. His request was denied. Instead, he was ordered to advance further, and after another day of hard fighting, the 106th permanently reoccupied the Chinese Trench, which ran between the Berghe and Byron Farms. By now, the Germans had retired in some strength to Wytschaete Ridge. The two-day operation ended with the 53d Brigade losing two officers and seventy-seven men killed, mostly from artillery fire.